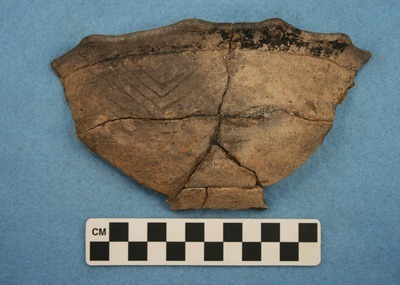 "41UR315, Burial 18, Vessel 91" by Timothy K. Perttula and Robert Z. Selden Jr.
DECORATION (INCLUDING MOTIF AND ELEMENTS WHEN APPARENT): The rim panel has a series of seven upper and lower engraved nested triangles. The smallest of each set of nested triangle has hatched lines in its three corners. Ripley Engraved, var. unspecified carinated bowl, Vessel 91, Burial 18.